Patna: Pal of gloom descended at the Patna airport when bodies of the five Central Reserve Police Force (CRPF) jawans belonging to different districts of Bihar arrived here on Tuesday evening. Unstoppable tears rolled from the eyes of the relatives who gathered there to collect the mortal remains of their dearest one. Six soldiers of Bihar lost their lives among the 25, who were killed in a Maoists attack in Sukma forest of Chhattisgarh on Monday. Relatives were in a state of shock and anger. They wanted final assault against Maoists who so far have reportedly killed more than 150 para military forces jawans in Chhattisgarh over the past a few years. CRPF personnel gave guard of honour to brave soldiers. 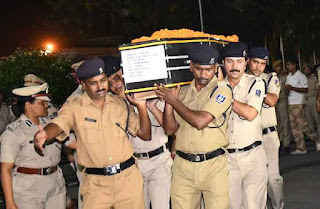 Union Minister Ram Kripal Yadav, Patna District Magistrate Sanjay Kumar Agrawal and Senior Superintendent of Police (SSP) Manu Maharaj and CRPF officers laid the wreaths on the casket to pay tributes to brave soldiers. Surprisingly not a single minister from the ruling Grand Alliance Government was there to receive Sukma braves at the airport. Abhay Mishra (Tulsigaon, Bhojpur), Krishnakant Pandey (Bharandua, Rohtas), Abhay Kumar (Vaishali), Naresh Yadav (Darbhanga), Ranjit Kumar (Sheikhpura) and Saurabh Kumar (Danapur) were from Bihar, who got ambushed by heavily armed Maoists in Sukma. The casket of Krishnakant Pandey was sent to his native village from Varanasi while the bodies of the five others arrived at Patna airport. 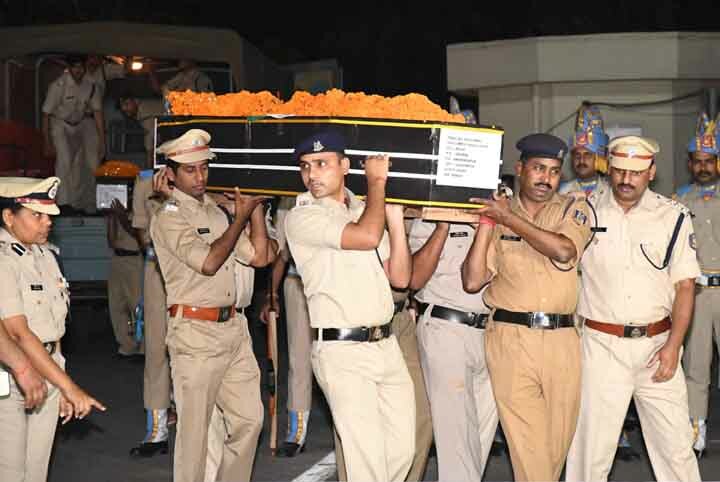 Later the five caskets containing the mortal remains of the jawans were sent to their respective villages. Meanwhile, Chief Minister Nitish Kumar announced a compensation of Rs 5 lakh each for martyrs. Paying tributes to slain soldiers, Kumar said country would always remember their sacrifice. He said the last rites of the jawans would be performed with police honour.